Precious metals were divided Monday with gold and silver closing lower and platinum and palladium finishing higher. Palladium logged a new record settlement. Gold for April delivery shed $1.40, or 0.1%, to settle at $1,301.50 an ounce on the Comex division of the New York Mercantile Exchange. "Gold price is dancing just above the $1,300 threshold, without a clear direction … bullion has been so far unable to surpass $1,310 and remains deadlocked close to $1,300 in this ‘wait-and-see’ scenario," Reuters quoted ActivTrades chief analyst Carlo Alberto De Casa. 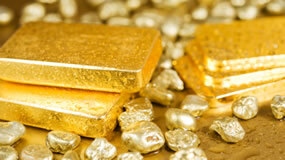 Gold futures ranged from a low of $1,298 to a high of $1,306.70. They rose 0.3% last week. Silver for May delivery dipped less than a half cent to close at $15.322 an ounce. Silver futures traded between $15.22 and $15.43. They lost 0.2% last week. April platinum moved up $2.20, or 0.3%, to $834 an ounce, ranging from $823.60 to $839.80. Palladium for June delivery advanced $21.20, or 1.4%, to $1,539.70 an ounce, trading between $1,500.90 and $1,541.80. The pair scored gains last week reaching 1.7% for platinum and 4.1% and palladium. Gold added $2.10, or 0.2%, to $1,305.60 an ounce. Silver added 2.5 cents, or 0.2%, to $15.38 an ounce. LBMA prices last week posted increases of 0.5% for gold, 1.6% for silver, 1.6% for platinum, and 3% for palladium. United States Mint bullion sales increased by a combined 1,000 ounces with equal splits between American Eagle and Buffalo gold coins.